The recent financial crisis showed that disregarding incentive-compatible allocations in lending can lead to extreme levels of financial market leverage and severe fluctuations. ADEMU co-ordinator Radim Bohacek suggests the best policy to prevent a collateral crisis is to act before it occurs, and examines whether restricting leverage in good times can achieve this aim. At the core of the Great Recession and financial crisis lay an interplay between macroeconomic imbalances and financial market innovations. The pre-crisis period brought large amounts of investment at extremely low interest rates, while new investment tools seemed to provide new means to diversify risk. Securitization led to complex and opaque instruments used as collateral for short-term liquidity, increasing leverage within the growing financial sector. The sustained period of strong global growth, low inflation and reduced macroeconomic volatility supported a self-reinforcing cycle of falling risk aversion and disregard for information asymmetries. Government policies aimed at democratization of credit and home ownership led to a widespread degradation of credit standards. In 2007, first signs of rising defaults in US subprime and alt-A loans led to liquidity and collateral crisis which escalated a year later with the rescue of Bear Sterns, the bankruptcy of Lehman Brothers, and central bank and government measures to prevent financial markets collapse. The collateral problem, rather than insufficient demand or irrational behavior, seems to be one of the main causes of the Great Recession that followed. The growth of both on- and off-balance sheet leverage has motivated the regulation of the leverage ratio (total assets to own capital), perceived as an effective counter-cyclical metric that helps to avoid excessive build-up during booms and the rapid deleveraging in times of stress, a process that can destabilize the whole financial system (see Adrian and Shin 2010 and 2013). Importantly, one of the main reasons for introducing leverage ratio restrictions was the observation that financial institutions that were severely affected by the financial crisis showed strong risk-based capital ratios before the crisis. The leverage ratio is supposed to complement the risk-based capital requirements as a simple, transparent, politically neutral, non-risk based “backstop” to mitigate cyclical fluctuations, being a tighter constraint in booms and a looser constraint in recessions. Countries that have used a maximum leverage for mortgages (Canada, Switzerland, Hong Kong) have fared much better during the Great Recession and have experienced much lower price volatility in housing and financing markets. Moreover, leverage ratio also decreases the risk of contagion in the financial system (Brunnermeier and Pedersen (2009)). On the negative side, leverage regulation might tend to disadvantage borrowers with low savings and might actually push some of them towards alternative and riskier sources of borrowing (credit cards, unsecured loans). Overall, regulation of the maximum leverage ratio is expected to protect the borrowers/lenders against the consequences of imprudent borrowing/lending, to constrain excessive credit growth and price increases, and to reduce the amplitude of economic booms and busts. Leverage regulation can be implemented within the financial system at the institutional level (bank capital to asset ratio) or embedded for borrowers in collateral downpayment margins and ‘haircuts’. In recent macroeconomic literature, Geanakoplos (2009) and Geanakoplos and Fostel (2012) show that collateral rates or leverage seem to be more important to economic activity and asset prices than interest rates. During a leverage cycle there is too much leverage in normal times and therefore too high asset prices and vice versa in bad times. The loan-to-value ratio on new loans does change dramatically over time and its rapid change is an important source of economic crises. This leverage cycle makes returns riskier, creates an inefficient mix of skills and allocation of resources in the economy. During the recent collateral crisis, leverage and prices fell dramatically after 2006, the average down payment (margin) for mortgages jumped from 2% to 25-30% and hedge fund margins on AAA securities increased from 5% to 70%. Importantly, during this time period the interest rates have not changed much. 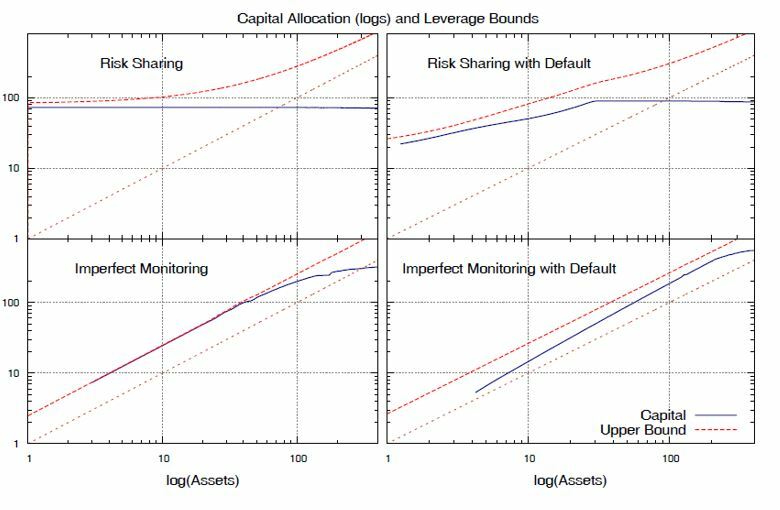 An ADEMU working paper which has yet to be published, Leverage Bounds with Asymmetric Information and Default, derives endogenous leverage bounds arising from adverse selection and moral hazard between borrowers and lenders in an environment with imperfect monitoring and default. Using the evidence on financial frictions, the paper builds a dynamic general equilibrium model with heterogeneous agents and occupational choice, financial constraints and endogenous financial markets. Each agent compares the expected value he or she would obtain from being a worker to the expected value of becoming an entrepreneur. A worker receives a wage while an entrepreneur establishes a firm with capital investment, employs other agents as workers, and realizes profit from a decreasing-returns-to-scale production technology. The occupational heterogeneity is important as workers (together with the less productive or unconstrained entrepreneurs) lend their assets to entrepreneurs who can use them more productively. An important feature of the model is the commitment of resources to risky business projects. Entrepreneurs with low assets but high skills might be constrained in their entry or firm-size decisions. Entrepreneurs thus face a financing constraint as they have to repay loans and salaries of workers in each state of the world, namely if the project fails. General equilibrium prices accommodate supply and demand for assets and labor. Under perfect risk-sharing and full information, financial inter-mediation allocates resources to the most productive use regardless of the collateral position of a borrower: the most talented entrepreneurs operate firms at the optimal size. As competition among entrepreneurs reduces their profits, welfare gains mostly apply to workers who benefit from higher equilibrium wages and the possibility to receive higher return on their savings (similar to Geanakoplos and Fostel 2012). Numerical simulations show that higher quality of financial markets increases efficiency, improves average welfare and reduces inequality. With asymmetric information and/or default, financial markets cannot provide full insurance against risk and restrict lending by demanding collateral, that is, financial markets impose an endogenous maximum leverage bound on each borrower. Consequently, high productivity but poor entrepreneurs (firms) are not able to borrow the optimal amount of capital while low productivity entrepreneurs with assets (collateral) become relatively more important. Figure 1 shows leverage bounds (dashed line) and the allocation of capital to entrepreneurs as a function of assets at equilibrium prices. The top left panel represents the optimal allocation in the economy with full risk sharing, where the allocation of capital is a horizontal line independent of assets. Without perfect risk-sharing, collateral is required for incentive-compatible allocations and resources are allocated towards less skilled but wealthy agents. Note that the more severe frictions, the less efficient allocations become, requiring more assets to enter or expand the firm. Incentive compatible allocations from these information and financial frictions can be mapped into leverage bounds, for example required down payments or margins (the inverse of the leverage ratio). In the full information, risk-sharing economy the average margin is around 19%, while it increases to 25% in the case of default, and up to 50% in the imperfect monitoring. When default is present together with imperfect monitoring, the margin is even higher, depending on the recovery rate. Naturally, these incentives lead to higher accumulation of assets in the steady state needed as a collateral for obtaining loans. Allocation inefficiencies have large adverse effects on aggregate productivity, welfare and inequality. Default in combination with information asymmetries lowers welfare by 7-14% (frictions increase the rent to entrepreneurs while welfare of workers falls by 25-40%). As in Geanakoplos and Fostel (2012), workers suffer welfare losses from low wages and inefficient production. These leverage bounds are used to simulate the trade-off from the leverage ratio macro-prudential regulation: in good times, restricting leverage is costly as it limits the efficient allocation of resources to their most productive use. On the other hand, the regulation provides incentives for accumulation of assets that prevent excessive deleveraging during a recession or after a change of regulatory framework. In the paper, good times are modeled as steady states without information frictions with full risk sharing, with each steady state characterized by a different values of the collateral margin that can be mapped back to asymmetric information or financial frictions: from 0% (no downpayment), to 10%, 20%, 30%, and 40% collateral margin required for each loan, respectively. These steady states with full risk-sharing are then exposed to an unexpected, permanent informational shock after which financial institutions start taking into account adverse selection and moral hazard problems and/or the possibility of default. In other words, the initial risk-sharing steady states represent the long moderation period when all actors believe they are in the good state of the economy when default or asymmetric frictions are not binding (for example, due to government policies promoting borrowing). Then alarming news occurs and the markets realize the presence of asymmetric information problems and/or default. The question is at which cost in terms of efficiency and welfare in the steady state the leverage ratio regulation alleviates the effects of information shocks. Figure 2 summarizes this trade off from imposing the leverage ratio regulation. The x-axis represents the steady state GDP loss in steady states with collateral regulation relative to the most efficient steady state without the regulation. The y-axis shows the fall of GDP when the information shock arrives. When no leverage ratio is imposed (m=0%), the risk-sharing steady state is efficient (0% GDP loss) but when a crisis occurs, the GDP falls by 7%. 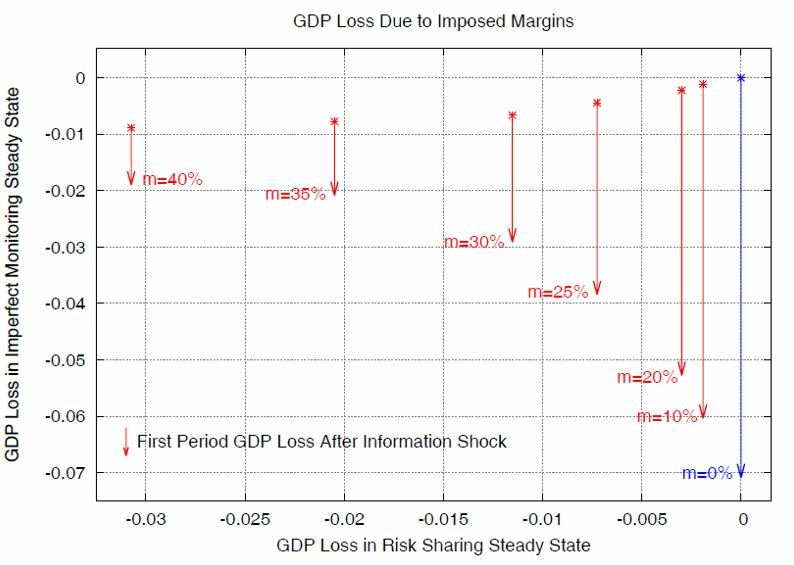 On the other hand, a 30% down payment margin imposed on the economy leads to 1.2% of GDP loss in the risk-sharing steady state but only to 2.1% GDP loss in the crisis. The steady state losses from leverage regulation do not exceed 1% of GDP. The recent financial crisis showed that disregarding incentive-compatible allocations in lending might lead to extreme levels of financial markets leverage and severe fluctuations. Possibly the best policy to prevent a collateral crisis is to act before it occurs. Restricting leverage in good times might be a policy that can achieve this end. This model generates endogenous leverage bounds when a possibility of default and imperfect monitoring are present, individually or jointly, in an environment that does not display irrational behavior or expectations. There are several extensions important for optimal macro-prudential regulation: a counter-cyclical variation of the leverage ratio over the business cycle, alternative definition of accounting variables in the leverage ratio, differential regulation of different assets and contracts, the regulation of related indicators (loan-to-value, loan-to-income, and others), and finally, the degree of complementarity to risk-weighted capital requirements. 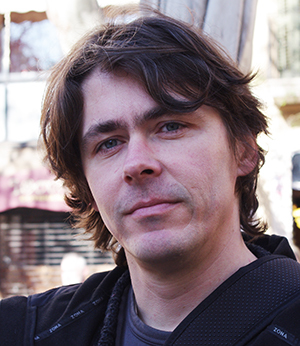 Radim Bohacek is a senior researcher at CERGE-EI, Prague, the Czech Republic. He is a coordinator of work package 3 of the ADEMU project: Macroeconomic and Financial Imbalances and Spillovers.